Modern diets are riddled with toxins from pesticides on our foods, caffeine and alcohol in our beverages, and processed ingredients in our meals. Eliminating all toxins from your diet would be ideal, but is next to impossible in today’s world, especially for parents and professionals who are constantly on the go. Performing an internal cleanse is the best way to detoxify your body so it can reset itself to physical and spiritual wellness. Toxins can weigh your body down, making you feel like you’re dragging your body through each day instead of living it. Each time you ingest a toxin, you are essentially poisoning your body in small amounts. Your energy levels drop, your ability to manage daily stressors is compromised and you ultimately feel overwhelmed at the most simple tasks. Cleansing your body with GIATrim CLEANSE formulated with single file alignment (SFA) technology will allow you to harness the hydration benefits it provides while supplying the natural benefits of a nourishing and gentle detox, helping your body return to natural energy levels. 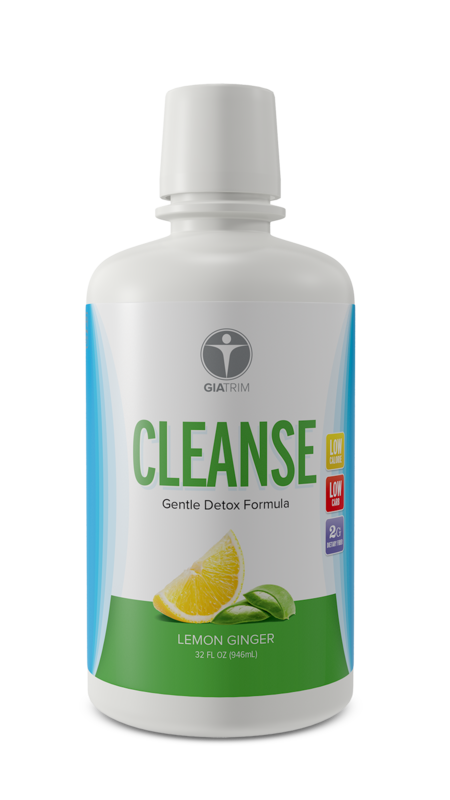 GIATrim CLEANSE contains lemon juice concentrate which has been shown to naturally energize and revitalize your body so you can thrive again. Consistent daily doses of toxins can rob your body of vital nutrients and hydration, while also making normal bodily functions like sleep and exercise difficult. Your body may retaliate by giving you persistent headaches, especially if you regularly consume substances like caffeine and alcohol. These toxins make your body constantly work in overdrive fighting dehydration and working to eliminate poisons at the same time. The best way to alleviate these kinds of headaches isn’t by reaching for ibuprofen, it’s cleansing your body. Cleansing with GIATrim CLEANSE can eliminate waste at a cellular level using its SFA technology. Pollutants hiding in your cells may be pushed out because its SFA molecules are aligned in the natural formation your body is meant to absorb molecules. The result can be the elimination of harmful toxins which perpetuate your headaches, while your body receives the other benefits of a gentle detox. Your body will try to push some toxins out of your body through the surface, clogging your pores, exhausting your complexion and creating a tired appearance. Toxins from smoking and pollution can leave your skin looking dull and lifeless, while other toxins dehydrate your body making your skin dry and itchy. GIATrim CLEANSE doesn’t just clean out your internal system which can lead to fewer breakouts, but because it is activated with SFA technology it can also promote younger looking skin and natural collagen production through the optimal hydration it provides. Your liver and kidneys are among vital organs aiding in digesting foods and processing toxins. If these crucial organs become backed up trying to process excess toxins, you may experience discomfort and irregularity. These symptoms are unpleasant and inconvenient, especially when you’re trying to live a productive lifestyle. The SFA technology GIATrim CLEANSE is created with has been shown to support a healthy intestinal flora and natural detoxification process. This drink is created with chicory root which can help the flow of bile, thus gently helping to improve digestion. When your body is busy trying to eliminate excess toxins, it can’t fight bacteria and viruses as efficiently, leaving your body prone to diseases and illnesses. If you’re frequently needing to take medication for illnesses, you may benefit from a cleanse. GIATrim CLEANSE has SFA technology which has been shown to support antioxidant effects and has antifungal and antibacterial properties. The drink also contains turmeric which has been proven by Boston Tufts University to power up the liver by 89 percent. A more efficiently functioning liver can contribute to better overall health. If these signs sound familiar to your personal daily life, it’s probably time for a cleanse! Taking time to eliminate toxicity within your body is key to staying revitalized, refreshed and at your best.